I’m sure like me, you have seen the advertisements for Reading Eggs, maybe you have even given them a try, if so, I would love to hear your thoughts. We have been working with the program now for a few weeks and have loved the addition of the physical workbooks that Reading Eggs now offers. We have been using 200 Essential Reading Skills for Kindergarten to go along with our lessons. We won’t officially begin our school year until next week, but we have slowly been easing our way back into school work. As some of you may recall my 6 year old is still not reading or even identifying all her letters and sounds. I have made the official decision in my heart and more importantly in my brain to not be concerned by this, because she is so smart and does well in so many other areas that I believe she will eventually catch on. So I am taking a more relaxed approach to reading with her than I ever did with my other children. Reading Eggs is a great fit for this approach. It takes a more gentle and fun approach to learning than some of the other programs that we have reviewed, while still offering consistency and repetition in their approach. Reading Eggs is an interactive website designed to get kids reading through games, activities, songs and awards that motivate. This is a completely interactive program that is engaging and fun. There are 120 lessons that focus on phonics, spelling, sight words, phonemic awareness, comprehension, vocabulary and fluency. Before doing this review I never knew that the Reading Eggs program was suited for children up to 13 years old. Before getting started with the program there is a placement test to ensure that your child begins at the appropriate level. I love the bright pictures, the fun characters and the stories that are included throughout the online lessons. It’s so fun when the characters become animated and sing. I will admit I was impressed with the quality of the animation. It’s just like watching a children’s cartoon. I also really appreciate that you can complete a lesson online and then move on to the workbook with a lesson that coordinates with what you just learned online. I think this solidifies the learning of each concept. 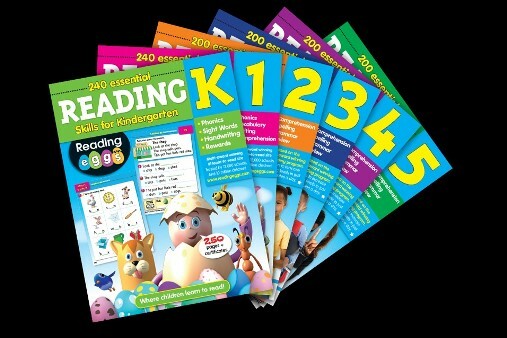 Reading Eggs has workbooks to go along with each level of online learning. The Kindergarten reading workbook has: 60 easy-to-achieve lessons, this book covers the 240 essential skills your child needs to excel in Kindergarten reading. Reading Eggs suggest that you work slowly through the workbook, I’m not sure what qualifies as slow but we basically did two pages a day that corresponded with the lesson. Having spent about 15 minutes in the online lesson and another 10-15 minutes on the workbook, this was about all my 6 year old could handle for reading without becoming frustrated. Reading Eggs also has a math program called Mathseeds that we have been enjoying as well with the same high quality lessons found on the reading side of the website.